As a kid, shepherd’s pie was one of my favorite meals. What’s not to love? Hearty, ground beef with vegetables and a bit of gravy, slathered in creamy mashed potatoes… Heaven, right? 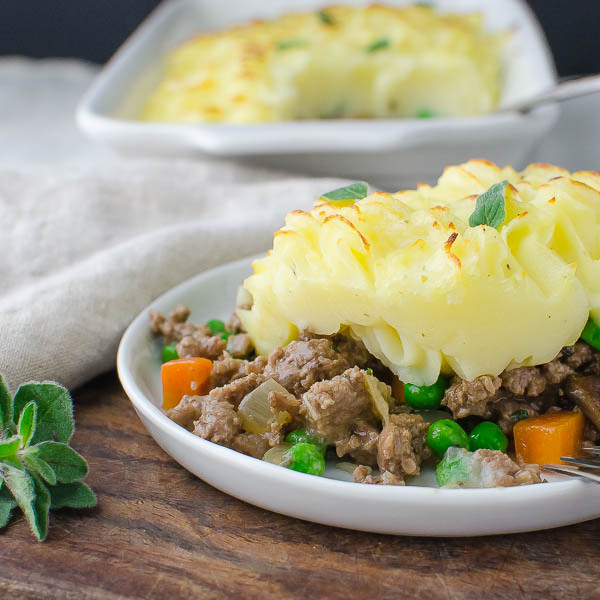 Homestyle Shepherd’s Pie is about as “comfort food” as you can get! You’d think this would be a homestyle staple in our house. You’d be wrong. In fact, I haven’t had a shepherd’s pie since my Mom made them – oh so many years ago… and that’s a shame, because despite its humble ingredients, it’s absolutely spectacular! I made this one for a blogger meeting I was going to one night. Picture a group of lady bloggers (most of them lifestyle and Mommy bloggers — I’m the only one who focuses on food) gathered around in the host kitchen, sipping wine, snacking on pot luck items and oohing and aahing over this shepherd’s pie. Of course, while I was at my meeting, Scott was at home having to “fend for himself.” Naaaaa. I left a “hungry man” sized portion in a casserole dish just for him. He just needed to slip it into the oven to heat. When I got home that night around 10:00, I asked him how his dinner was, to which he replied, “Good, but I didn’t know if you needed to “shoot” it, so I left most of it in the fridge. I felt kinda bad — he didn’t know if he was “allowed” to eat the whole thing. I told him I made it just for him – at which time he stood up, grabbed the dish from the fridge and nuked it. Then sat eating fork to mouth until the whole thing was devoured. Don’t feel pressured into using a pastry bag though — a spatula and some swirly motions will give you equally stellar results. Before baking the casserole, I dabbed a little melted butter over the potatoes to help with the browning. I didn’t want the crust to be too brown, but I wanted it to appear “baked”. I think it worked. If you love casseroles, you’ll also want to check out this Cheesy Tuna Noodle Casserole, Savory Pork Penne Casserole and these yummy Enchiladas. A homey, warm comforting dish, perfect for a cold evening. Place cut potatoes in a large saucepan and cover with water. Bring to a boil, reduce heat to simmer and cook for 18-20 minutes or until potatoes are tender. Meanwhile, in a large skillet, heat one teaspoon of olive oil over medium high heat and add the mushrooms and a 1/4 teaspoon of salt, stirring occasionally 3-5 minutes until mushrooms are softened and give up their liquid. Transfer mushrooms to a large bowl. Add 1 teaspoon olive oil to the pan and stir in the onions and carrots and another quarter teaspoon of salt. Cook over medium high heat until onions are tender and translucent and carrots are slightly softened. Transfer the vegetables to the bowl with mushrooms. Heat the remaining teaspoon of olive oil and add the ground beef, breaking apart the meat with the back of a fork and browning. When the meat is about half way cooked, add the garlic, rosemary, oregano, 1/2 teaspoon kosher salt and 1/4 teaspoon black pepper. Cook stirring until meat is fragrant and completely cooked through. Transfer the beef to the bowl with the vegetables and stir in the frozen peas. Melt 1 1/2 tablespoons butter in the pan and add the flour, 1/2 teaspoon salt and 1/4 teaspoon black pepper. Stir to combine and cook over medium high heat, stirring constantly for about one minute, until bubbly. Slowly add the beef broth and cook, stirring constantly until mixture thickens and comes to a boil. Boil and stir one minute. Stir in the gravy master and worcestershire sauce. Remove from heat and add the gravy to the beef and vegetable mixture. Stir to combine. Set aside. Drain the water from the potatoes. If using a potato ricer, select the smallest extruder disk and run the potatoes through the ricer then stir in the butter, sour cream, salt, pepper and milk. If using a potato smasher, add remaining 2 tablespoons butter, sour cream, 1 teaspoon kosher salt and 1/2 teaspoon black pepper to the potatoes. Smash the potatoes, incorporating the dairy products. Stir in the milk. Potatoes should be smooth, but firm, holding their shape when you run a spoon through them. Spray a large casserole dish with vegetable spray. Spoon the meat mixture into the casserole and spread out evenly with a spoon. To pipe potatoes, select a large pastry tip and fit it in the bottom of a pastry bag. Fill the bag halfway with potatoes and fold the open ends of the bag together tightly. Gently squeeze the bag from the top, extruding the potatoes out over the casserole. If you don't want to use a pastry bag, spread potatoes over the casserole with a spatula, creating divots and swirls. (casserole can be made to this point, covered and refrigerated to bake later). Carefully dab the melted butter over the top of the potatoes. Bake casserole in the center of a hot oven for 20 minutes. To brown the potatoes more, set the oven to broil and broil the casserole for 3-5 minutes until lightly browned. Serve. Just discovered your blog! We are old friends of your Mom and Dad’s, and knew you well as a baby when your Dad and Bill were stationed in San Diego, and then later living in Northern Virginia. I will enjoy following you. It is obvious you have your Mom’s gift for both cooking and writing…she is great at both. About the Shepherd’s Pie…your Mom made it all the time when we lived in San Diego and Bill raved about it. When I came across it on your blog, it made me smile. Hope your folk’s place in the Keys survived the storm, I have been thinking of them, and have misplaced your Mom’s cell #. Give your Mom and Dad our best! So nice to hear from you Glenda! That Shepherd’s Pie is a definite comfort dish in our house — and I have fond memories of it from my childhood. I’ll pass on Mom’s contact info for you. This sounds super yummy and perfect for Fall! And, wowza, your potatoes looks so pretty like that!!! Dang, auto correct didn’t correct my spelling. This is hands down the best sheperd’s pie I have ever eaten. Bud’s daughter and 5 year old granddaughter came for dinner. No trouble getting Gracie to eat her dinner and Jennifer and Bud were feeling overstuffed after the 3rd helping. I used dried herbs and fresh garlic and some frozen peas and corn because they had been in the freezer long enough. The recipe didn’t mention the garlic or peas but your pictures show peas. The potatoes were delicious with Chobani yogurt. I am a slow poke at everything I do. I’d like to know how long it took you to create this dish. I started at 3:15 and set the casserole on the table at 6:15. Hi Pat! So glad you enjoyed the Shepherd’s Pie! Thanks for catching the peas – I don’t know how I missed that, but I’ve fixed it. As far as active time in the kitchen, this took me about 1:15 — peeling, chopping, mashing, assembly etc. but when shooting this for the blog — it was a solid 4 hours. This is such a great old timey comfort food. Love your small diced carrots and your mashed potatoes are so pretty! This looks so delicious! Such a comforting classic. Perfect for autumn! I’m telling you — pastry tips are the bomb! Now here is a meal I haven’t had in a long time. I love how beautiful this looks but so delicious too. I am going to add this to my list of recipes to try. Yummy! I hadn’t made shepherds pied for such a long time and then I made it last week and everyone loved it. Of course mines wasn’t as bonnie as yours with the piped mash. Note to self, must try harder! Never had my food referred to as “bonnie”. I like it! Yes indeed!! Shephard’s pie is truly a classic comfort dish. I always go for the mashed potatoes first and when I make it I usually pile on extra spuds. I’m just a gluten for carbs! Those potatoes do look pretty amazing! Such a wonderful comfort food. It was so sweet of him to check and see if you needed to photograph first 🙂 Sounds like you had a great time. He’s a good guy – he deserves his own casserole, don’t you think? I love how pretty you got the potatoes to lay. I am horrible with those frosting bags…I always end up with a disaster on my hands when I try to use it. I’m not so great with them either, but it’s amazing how people respond to pastry tipped potatoes!